Candomble is often seen as a strange and unfamiliar religion, but to those who know its cousins, one of which is the Yoruba-based Santeria—which hails from Cuba—Candomble will feel vaguely familiar. Candomble is an African-Brazilian tradition that, over time, absorbed many Catholic tenets. The word “Candomble” means “dance of the gods” and is a religion practised by “povo do santo” or “people of the saint.” While this religion is mostly from Brazil, it has over two million followers, primarily in countries such as Uruguay, Venezuela, and Argentina. Candomble was founded in the 19th century in Salvador, Bahia, where the first temple was raised. In all actuality, however, the religion is essentially a “creolisation” of Yoruba, Fon and Bantu beliefs from West Africa. 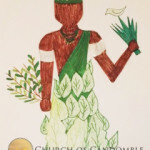 From the mid-1500s to 1888, Candomble had been influenced by the African priests who, despite being slaves, continued to teach their mythology and culture while blending in parts of Catholicism and indigenous American traditions. Later on, Candomble practitioners were violently persecuted for their faith by the Roman Catholic church, right up till the 1970s where the ban on Candomble was repealed and the police were allowed public ceremonies. Candomble has its roots in Yoruba, Fon and Bantu beliefs. Followers of Candomble believe in a supreme being named Oludumare, who’s served by lesser beings called “orishas,” or “orixas” in Portuguese. Candomble is an oral tradition, so there are no scriptures to follow, and music and dance are very important to Candomble’s adherents, as music and dance allow them to be possessed by the orishas. 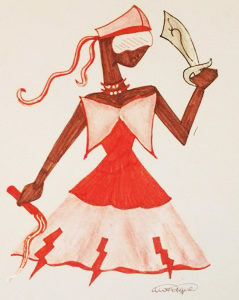 Another interesting aspect of the Candomble faith is that it is not a dualistic religion, meaning practitioners don’t believe in the concepts of “good” or “evil,” but rather they believe that each person has a specific destiny that they must fulfil to their greatest capacity, whatever it might be. That said, they believe each practitioner has a tutelary, or guiding, orisha which controls the practitioner’s destiny and is that person’s protector. In Candomble rituals, orishas are presented with offerings from the vegetable, animal or mineral kingdoms. There are other entities that belong to the Candomble religion: the voduns of the Fon and Ewe (Jeje) nations, as well as the nkisis that come from the Bantu tribe. Because of its blend of various forms of African tradition and aspects of Catholicism, Candomble has a rich history and form of spirituality well worth exploring fully. Just as the orixas (“orishas”) are an integral part of the Candomble religion of Salvador da Bahia, Brazil, so, too are the colourful bead necklaces of the practitioners. In many religions, certain items have specific spiritual meaning. It is no different with Candomble. The bead necklaces that are commonly worn are considered an outward manifestation of their orishas. Whenever these beads are consecrated, either by blood sacrifice or are run through a sacred herbal bath, the necklace shares in what’s called the axe’ (“ah-shay”), or the spiritual force that permeates everything. But it’s not just the beads themselves that mean something when consecrated. When devotees learn of their guiding orishas, they will wear necklaces representing the orisha or orishas that guide them, the beads in the same colours as that particular orisha. Additionally, when the beads become consecrated, and with the proper offering, the beads don’t just represent the divine spirits, they become those spirits, just as the Candomble practitioners become possessed of their orishas while dancing. This sort of consecrated empowerment allows the necklaces to be protective talismans for the wearer, but they can also harm the owner. This emphasises the level of responsibility required just by owning the beads. In short, blessed and consecrated bead necklaces require a level of devotion and solemnity that ordinary jewelry does not. As mentioned before, each orisha is said to choose its devotee, and passes power to that chosen person, finding a way to communicate that this is the spirit belonging to that particular individual, that that individual has the right, the power to wear the specific colour of beads, and is in the right state of mind and heart to worship and make offerings. Each colour range, such as greens, blues, whites, yellows, reds, black and so on, belongs to an aspect of nature, of the natural force of things, emphasising Candomble’s focus on seeking to harmonise and blend with nature, the Orishas embodying and representing the powers of the wind, sun, earth, fire and water. So to the casual onlooker, the multiple strands of coloured beads made of clay, glass and perhaps plastic are just that: multiple strands of beads. But to the Candomble practitioner who is forever devoted to their orisha, the strands of consecrated colours are much more than ordinary strands. They are a connection to their spirituality, to the earth, to the orishas themselves. What Are the Entities of Candomble? If you are at all familiar with the religions that have been brought over from Africa and melded in syncretistically with other religions, particularly Roman Catholicism, you’re likely familiar with the Afro-Brazilian religion known as Candomble. Orishas are considered powerful nature gods, and they are neither wholly good or wholly evil. Like us, they contain a bit of both, but still emanate from and serve the supreme Creator, Olodumare, who is considered divine. How can a god be neither good or evil, but still be divine? In Candomble, they don’t have a concept for “good” or “evil” like other religions seem to. They do, however, believe that if you do what many would consider evil, that evil will come back to you eventually. That said, Candomble is not a dualistic religion, so comparisons between typical Judeo-Christian judgments between what’s good and bad don’t entirely match up to what’s practiced in Candomble. Practitioners also believe in destiny and that one should fulfil one’s destiny to the fullest, whatever that may be. Candomble practitioners also believe that each practitioner or devotee has a teaching spirit that’s with them always and protects them. Just as Candomble is syncretistically practised with Catholicism, Candomble is polytheistic in the sense that they worship not just the orishas but also the voduns of the Fon and Ewe nation, as well as the nkisis/minkisi of the Congo. One of the well-known and most revered orishas of Candomble is Exu. Exu is, more or less, similar to the Greco-Roman god Hermes/Mercury, in that he is a messenger between heaven (“Orun”) and Earth (“Aiye”). Because he is also sensual and mischievous as well as a bit provocative, he was labeled as something of a Satanic figure, which is completely misguided. 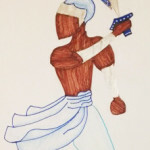 Because Exu is the orisha of communication between heaven and earth, he is honored before all other orishas, to guarantee his function as messenger is completed. Each orisha has a feast day, favorite song, drumbeat, etc, and the orishas are part of what makes Candomble such a fascinating religion. One of the most important aspects of the Candomble religion from Brazil are the group of orixas, or “orishas” that are honoured and revered with ritual offerings.